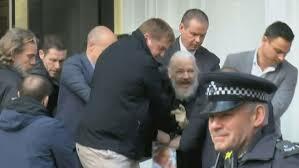 The UK Home Office also confirmed the extradition request in a statement, adding, “He is accused in the United States of America of computer related offences.” Assange was initally detained for “failing to surrender to the court” over a warrant issued in 2012. Assange “violated the norm of not intervening in internal affairs of other states,” Moreno said. “The most recent incident occurred in January 2019, when WikiLeaks leaked Vatican documents. Key members of that organisation visited Mr Assange before and after such illegal acts,” he added.